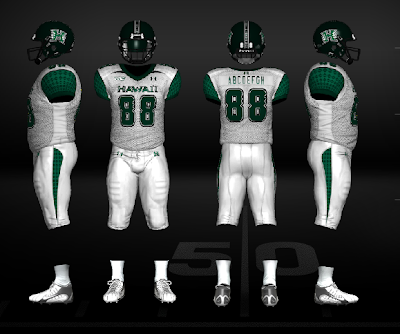 Over at Sportshawaii.com, Red Gun found UH's new white pants on EA's new team builder site. If any of you are curious what the new white pants will look like, you can see them on EA's new Team Builder website, which is part of the upcoming NCAA 2010 football sim. Team Builder allows you to create your team, including the ability to incorporate any logo you want, provided it isn't in bad taste. 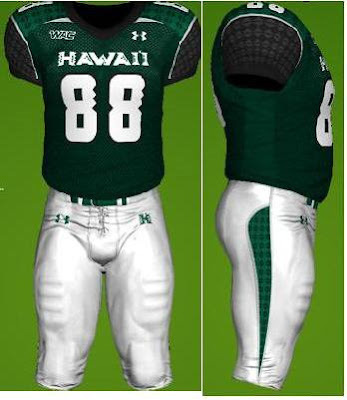 To see the new pants just create a team and when you get to uniform editor go to pants and select existing, then WAC, then scroll right until you see the Hawaii pants. There are black, green and the new white. I will say this, the new white pants are by far the best looking of the bunch. Using the site, here's a screenshot of what the new away uniforms may look like for 2009. The team builder site also an option for green jerseys, which Coach Greg McMackin mentioned was in the works back in 2008 when the Under Armour deal was announced. WenatcheeWarrior posted a screenshot of it over on WSN. UPDATE: Flyin_Hayn posted a screenshot of a green and white combo on SH's Computer Info and Gaming forum last week. Guess this is old news then! In any case this would look good with the rumoured (or imagined) white helmet. Wow. gonna be real easy to spot the next away game at Boise... Strike FEAR, Warriors! yeah, i loved the all black unis. maybe one day they can take the black sleeves from this green one and put it back on the black jersey. awww yeah. Where can I buy a Green Football jersey ?